Some of Truman’s Burton-brewed beers are a bit of a quandary. What the hell were they? Where were they Sold? And it what format? All very reasonable questions, to which I have no answer at all. 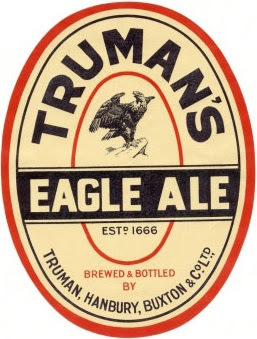 Looking at the OG, I’d have guessed that this was Truman’s draught Burton Ale for their London trade. Except all the analyses I have of Truman Burton are around 1048º. And R4 turns up far too seldom in the brewing logs to be as popular a beer as Burton Ale. It’s all rather a mystery. As is where exactly many of Truman’s Burton beers were sold. The Pale Ales, obviously, were sold in their London estate. But what about all the Milds? I doubt they were served in the capital. Most likely they were consumed in the tied houses Truman ran in the Midlands. But R4 – what was its target market? Sadly, the Whitbread Gravity Book isn’t much help. It almost exclusively concentrates on the beers Truman sold in London. Very frustrating. The recipe of R4 is closer to the Pale Ales than the Milds, lacking crystal malt and having lower percentage of high-dried malt. The hops were all English, from the 1937 and 1938 harvests. No. 3 invert is my guess. The log only specifies invert, not the exact type.